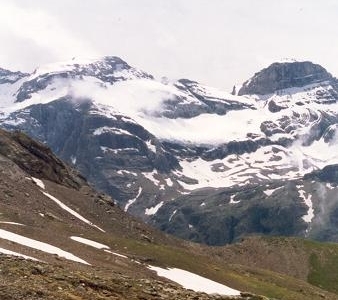 Monte Perdido is the third highest mountain in the Pyrenees. The summit of Monte Perdido (3355 m), located in Spain, lies hidden from France by the seemingly impenetrable peaks of the Cirques of Gavarnie and Estaubé. It is in the north of Huesca province. The mountain forms part of the Ordesa y Monte Perdido National Park, in the west of the Pyrenees, in the community of Aragon, Spain.Access to the mountain is easier from Spain than from France. 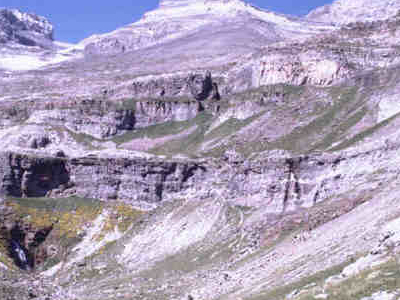 The route starts near the village of Torla, Aragon, at the Ordesa Valley and ascends the Cirque de Soaso towards the Refuge of Góriz before the stiff climb to the summit. It is a dangerous climb with snow. Here's the our members favorite photos of "Peaks or Summits near Pyrenees". Upload your photo of Monte Perdido!